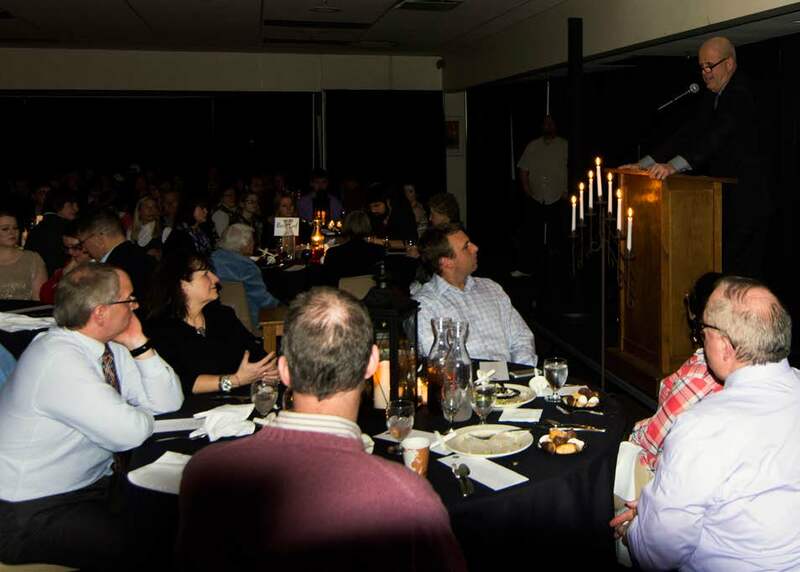 When I arrived at RMC’s 106th annual Candlelight Dinner on February 5th, my only thoughts were of free food. As a student without a meal plan, I feel like I should take advantage of a free dinner as often as possible. Quickly, I tried to shift my focus onto the spirit of the event. We were there to show appreciation for the scholarship donors who have generously provided funds for our education. The night began with a cocktail hour where donors, faculty, staff, and alumni could enjoy a drink, mingle with students, and have a light snack before dinner was served. When I arrived, I was a little bit nervous, having never been to the Candlelight Dinner and not knowing anyone, but I was quickly relieved by the sight of some of my close friends. We stood around in Fraley Lounge for the next hour staring at other groups of students and groups of non-students having polite conversation. We enjoyed hors d’oeuvres as we waited for dinner to be served. We noticed people moving toward the cafeteria and we joined them. When asked to do so earlier in the week, I volunteered to go around and light candles during the dinner. As a volunteer, I was asked to sit at one of the reserved tables in the front of the room by the podium. I sat with two other students and three alumni, who were friends when they attended school at RMC in the early 1950s. Jillian Shoemaker, director of alumni relations, took the stage at the beginning of the dinner to offer us the official welcome for the event. After the invocation, we were dismissed to dinner. The alumni we were seated with struggled to read the signs and see what was being served in the dim light. However, with our help, they got through the line and we got back to our seats. We all ate and got to talking about the school we love. The students at the table talked about what was different about the campus in the fifties. The biggest thing that the alumnus I was speaking to, Dorothy, had to say was that the campus was so open back in her day. Obviously, the newer buildings on campus weren’t around, such as Morledge Hall, the Bair Science Center, the Bair Family Student Center, Fortin Education Center, and all of the current residence halls. The old friends also talked about dorm life in the fifties. Back then they had a curfew of 11:00 pm and should they be caught sneaking-in, there would surely have been consequences. They told us a story of how Dorothy had been out late with her then boyfriend (and future husband) past the curfew. Her friend, the other alumnus we were were sitting with, snuck into her room on the first floor of Kimball and let her in through the window. Her roommate woke up and fell back asleep none the wiser despite sitting up in her bed. I was most impressed by the cunning and coordination of the students without the aid of technology. After talking for a while about the school as it once was, President Wilmouth took the stage and shared with us the history of the event. The first Candlelight Dinner was held 106 years ago when students first arrived to the campus. When they arrived, the dining hall was without electricity. Of course, without electricity they were unable to power their MacBooks and do their homework. They had to eat cold meat, beans, boiled potatoes, and doughnuts, all by candlelight. On that night in 1910, a tradition was born that would bring students of old and new together for the next 105 years and counting. One thing that President Wilmouth said that struck a note with me that night was about community. 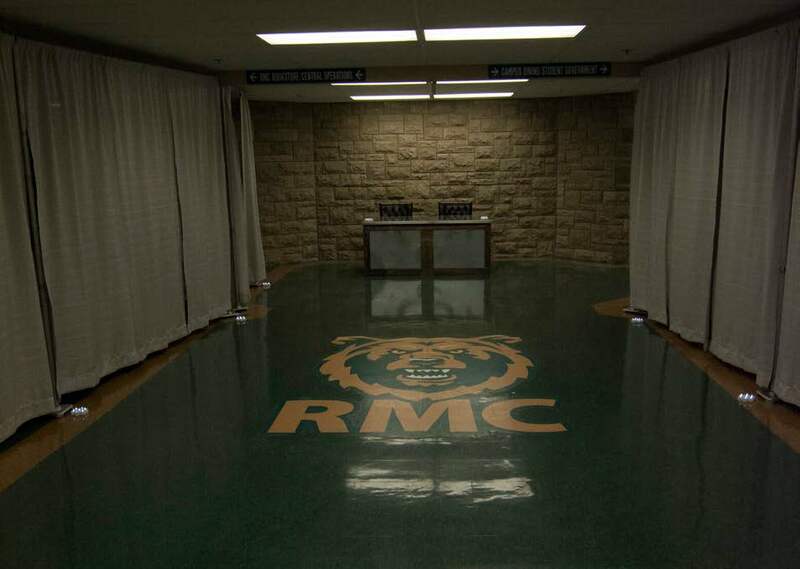 Rocky Mountain College has a huge community of alumni, students, faculty, and staff. While I looked around the room, what he was saying was on display there. RMC has a community that takes care of itself. After Dorothy’s husband passed away a few years ago, she established a scholarship in his honor. She isn’t the only example of an alumni giving back to the school. Many students at RMC receive generous financial aid provided by the community which President Wilmouth spoke of. Additionally, many former students have gone on to become businessmen and influential leaders in their communities. Many give back in other ways by becoming staff and faculty, serving on the board of trustees, or in ways that I, as a student, don’t realize yet. 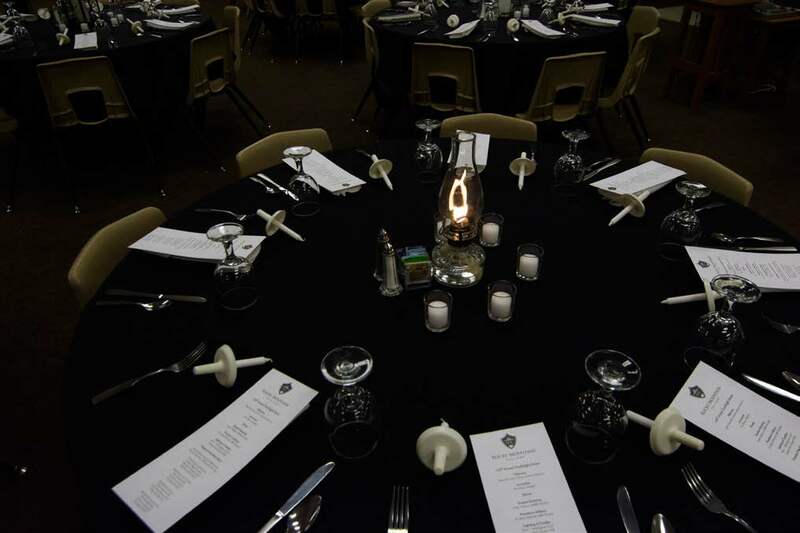 The diner is designated as a night with which we honor students, donors, faculty, staff, alumni, and our heritage. We honor our community. For my first Candlelight Dinner, I feel like the event did just that. This entry was posted in Issue 13. Bookmark the permalink.